The Exodus narrative documents each stage of the journey from Egypt to Mount Sinai, through the 40 years of wilderness wanderings, all the way to the conquest of the promised land by Joshua. Some interpretations of these locations have led to the conclusion that the mountain is in Egypt's Peninsula, but an Arabian location for Mount Sinai is certainly plausible if these Biblical locations are mapped out. Kadesh was one of the stages of the Exodus journey after the Israelites defied God during the Golden Calf Worship incident and were sentenced to 40 years of wandering the wilderness. Deuteronomy 1:2 states that Kadesh was an eleven-day journey from Mount Sinai by the way of Mount Seir. Many Bible maps place Kadesh at what is currently Tell el-Qudeirat. One of the objections to the Arabian location for Mount Sinai is that ancient peoples could not have made a trip from Jabal Maqla to Tell el-Qudeirat in an eleven-day time period. If Tell el-Qudeirat is Biblical Kadesh, then an Arabian location could possibly be challenged based on the distance. However, what if a widely accepted fact about Kadesh's location is incorrect? What if Kadesh was actually in another location? Based on ancient Christian and Jewish sources, we believe that Tell el-Qudeirat may not be the true Kadesh-Barnea. There are two primary reasons for our assertion. Kadesh within the Promised Land? Tell el-Qudeirat is located approximately 27 kilometers east of Wadi el-Arish, or the River of Egypt. This geographic feature is one of the boundaries of the land which God promised to Abraham's descendants in Genesis 15:18. On that day the Lord made a covenant with Abram and said, "To your descendants I give this land, from the Wadi of Egypt to the great river, the Euphrates..."
Joshua 15:2-4 also defines the Wadi as Israel's southern boundary marker. Their southern boundary started from the bay at the southern end of the Dead Sea, crossed south of Scorpion Pass, continued on to Zin and went over to the south of Kadesh Barnea. Then it ran past Hezron up to Addar and curved around to Karka. It then passed along to Azmon and joined the Wadi of Egypt, ending at the Mediterranean Sea. This is their southern boundary. The order in which the southern boundary is marked appears to go from east to west, from the Dead Sea, towards the south, then all the way west to the Wadi of Egypt and the Mediterranean. Based on the boundaries laid out in Scripture, Tell el-Qudeirat is within the boundaries of the Promised Land. Since the Israelites did not step foot into this land until Joshua led them across the River Jordan, after the 40 years of wandering was complete, how could this spot be Kadesh? Where is the real Kadesh-Barnea? Even the most well-read Biblical scholars are not 100% sure of Kadesh's true location. It's been somewhat of a mystery for many centuries, but there are some guideposts we can use to determine an approximation. Numbers 20:1 states that the Israelites stayed at Kadesh and it was here that Miriam died and was buried. After 30 days of mourning, the Israelites made a short journey from Kadesh to Mount Hor, where Aaron died and was buried. The Jewish historian Josephus wrote in The Antiquities of the Jews that Kadesh-Barnea was a relatively short distance from the Arabian capital city of Petra during his day. Now when this purification [for Miriam], which their leader made upon the mourning for his sister, as it has been now described, was over, he caused the army to remove and to march through the wilderness and through Arabia; and when he came to a place which the Arabians esteem their metropolis, which was formerly called Arce, but has now the name of Petra, at this place, which was encompassed with high mountains, Aaron went up one of them in the sight of the whole army, Moses having before told him that he was to die, for this place was over against them. Eusebius of Caesarea also placed Kadesh at, or in close proximity to, Petra. adea Barne. The desert which extends to (the city of) Petra a city of Arabia. There Mariam went up and died, and there the doubting Moses struck the rock to give water to the thirsty people. The tomb of Mariam herself is pointed out there even now. There also Chodollagomor beat the chiefs of the Amalakites." Eusebius of Caesarea, "The Onomasticon," Section K, Footnote 580. Kadesh and Petra appear to be a very short distance from each other according to these accounts. Since Petra is in Transjordan, it would not have been a short trip from Tell el-Qudeirat, but may have taken several days at least. As the crow flies, the distance is nearly 120 kilometers. Traditional Kadesh-Barnea (top left) to Petra, Jordan (bottom right) is about 120 km as the crow flies. Image obtained via Free Map Tools. Depending on the terrain, ancient peoples could travel about 10-18 miles per day, based on several estimates. 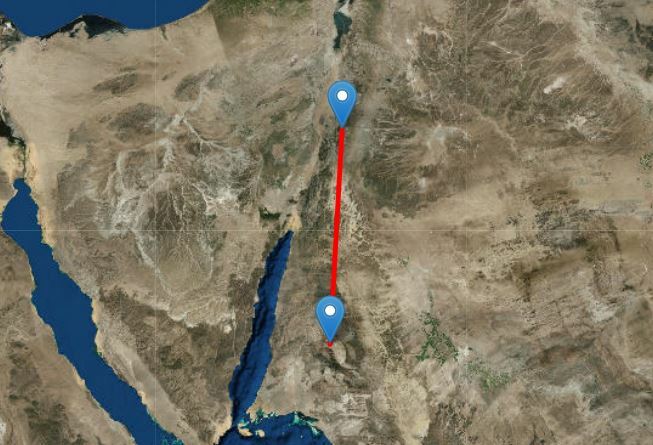 From Kadesh to Petra, this would mean an approximately 12-day journey if the Israelites were traveling in a straight line. But of course, hardly any journey is so simple. The Negev Desert is full of rough terrain that would make a journey to Petra far more than a few strides. But Numbers 20 and 33 both indicate that there were no middle stages between Kadesh and Mount Hor. It's difficult to accept the theory that the Israelites traveled from a location far to the west (and within the Promised Land) all the way east to Mount Hor, by Petra, and for the author to make no mention of any stops on that long journey. The author carefully documented each of the stages of the entire journey; skipping over that large a portion of time and travel does not fit with the pattern of the text. How does this relate to an Arabian location for Mount Sinai? Recall that Deuteronomy Chapter 1 locates Kadesh-Barnea as an eleven-day journey from Mount Sinai by the way of Mount Seir. As the crow flies, the distance from Jabal Maqla to Petra is about 188 kilometers, or 117 miles. Jabal Maqla (bottom) to Petra (top) is about 150 miles distance. Image obtained via Free Map Tools. On the contrary, from the traditional site in the southern Sinai Peninsula, the distance is almost 250 kilometers, or 154 miles. Not only is the distance longer, but this site is alsoin the heart of the wilderness, and is much further away from any ancient roads than Jabal Maqla (as the ancient city of Midian is a short distance from this mountain). This fact would have made this journey even longer than regular road travel. However, even if one locates Kadesh-Barnea at modern-day Tell el-Qudeirat, an Arabian Mount Sinai certainly does not necessarily become implausible. From Jabal Maqla to Tell el-Qudeirat, the total distance is 268 kilometers, or 166 miles. A further distance, yes, but not completely impossible. As the crow flies from Jabal Maqla to Tell el-Qudeirat. Image via Free Map Tools. Though distance may not necessarily be an insurmountable barrier, it is our position that Tell el-Qudeirat cannot be Kadesh because it is within the boundaries of the Promised Land as laid out in Scripture. 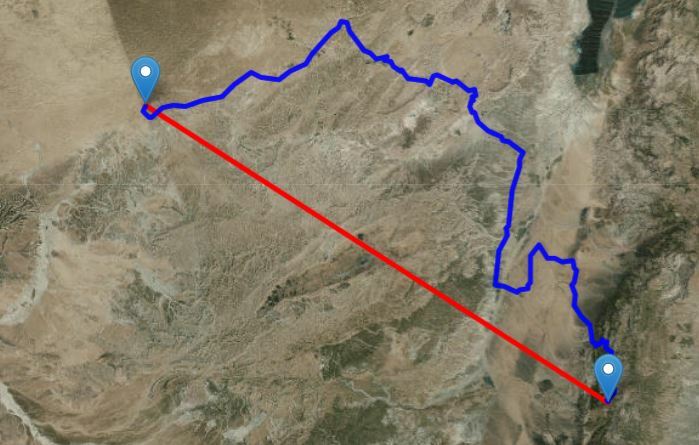 Based on the above information, it is our position that Kadesh-Barnea was in very close proximity to Petra. Its true location is still somewhat obscure because of the amount of time that has passed, but with Josephus' and Eusebius' accounts, the Biblical accounts, and mapping of the locations, we maintain that Jabal Maqla fits in relation to Kadesh. Ezion-Geber was a location at which the Israelites stopped during their journey out of Egypt and towards the Promised Land. Several hundred years after the Exodus, nearly 500, it is noted in Scripture again when the kingdom of Israel was in a period of expansion. Under the reign of King Solomon, Israel's territory and wealth greatly increased. Foreign leaders came from all over the known world to honor Solomon and seek out his wisdom. King Solomon also built a fleet of ships in Ezion-geber, which is near Eloth on the shore of the Red Sea, in the land of Edom. And Hiram sent his servants with the fleet, sailors who knew the sea, along with the servants of Solomon. Ezion-Geber was an ancient city on the kingdom of Israel's southernmost border at the sea. Eloth was another city in close proximity to Ezion-Geber, and modern-day Eilat is close to this ancient city's location. The author of 1 Kings clearly names this body of water upon which the fleet was built as the Red Sea, or Yam Suph. This further strengthens the theory that the sea the Israelites crossed several hundred years earlier was not a landlocked lake or a swampy, shallow body of water closer to Egypt. In our section on the Red Sea Crossing, we note the fact that the Sea of Reeds designation for Yam Suph has caused some confusion as to the sea's true location. However, based on additional research from Dr. Humphreys, this does not need to be a point of contention in identifying the Gulf of Aqaba as Yam Suph of the Exodus. Dr. Humphreys writes that the Gulf of Aqaba is a unique body of water. The Red Sea is a saline body of water, and reeds tend to not grow in salty water. However, there is a strange phenomenon at the northern part of the Gulf, as observed by one explorer in the early 20th century. (For more on the Red Sea Crossing, please visit our page dedicated exclusively to the topic). The claim that Yam Suph refers to a marshy, shallow body of water in the vicinity of the Nile delta or the Egyptian domain is highly questionable considering these facts. Solomon would not have made a fleet on a body of water that did not offer access to the open ocean, that is simply a matter of basic sense. The Gulf of Aqaba offered Solomon's fleet access to the Indian Ocean and the various sea trading routes in that part of the world, the other proposed locations simply do not. Solomon would not have built his fleet in Egyptian waters, at the Gulf of Suez, either. The 1 Kings account records Ezion-Geber as being in the realm of Edom, not Egypt. The only body of water that fits these criteria is the Gulf of Aqaba. With these things in mind, the Red Sea upon which Solomon built his fleet is likely the same Red Sea the Israelites crossed when fleeing Pharaoh's army.